Tomorrow between 10 a.m. and 6 p.m., the fourth annual Gaithersburg Book Festival will offer authors, poets, and activities for kids. Maryanne O’Hara, author Cascade, which I loved! Tara Conklin, author of The House Girl, which I liked! Lauren Leto, author of Judging a Book By Its Lover, which I adored! I hope that if you are in the area, you’ll stop by the panel or at least see some great authors. This is always a great family event and shares the love of books. 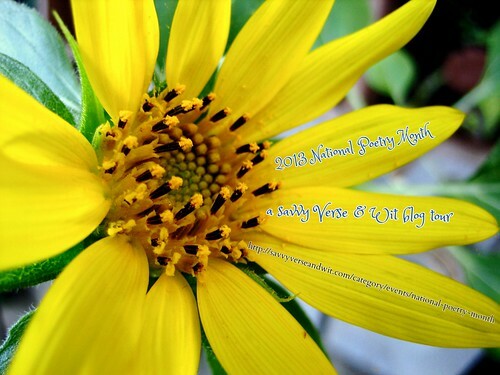 Click the image above for today’s National Poetry Month tour post! night thoughts: 70 dream poems and notes from an analysis by Sarah Arvio is a poetry collection that defies convention in its cathartic purpose as a series of free-association dream poems with accompanying notes on those dreams from the poet at the time she was tackling some serious trauma. It is more than a collection of poems and notes about those dreams they capture, it is a memoir written as she uncovers some deeply traumatic events in her childhood as she was on the cusp of womanhood. Arvio’s notes are essential in many ways to the understanding of her dream poems, which are often surreal and disjointed. The notes help carve out her images and how they associate to one another and which dreams came to her in the same span of time. She breaks down her word choices for lines in the poems, the origins of words and how their meanings are uncannily related to the trauma she experienced and subsequently forgot. She also provides insight into the artwork that she saw and that reminded her of the trauma and how certain colors appear and reappear in her poems because of their relation to the trauma. Arvio utilizes repetition of color and words in her poem to illustrate the remembering of a dream while awake, as the mind filters through the image details to carve out the truth of the events. Her poems read like dream interpretations without the conclusion, and in this way, she leaves the poems open to interpretation until the reader gets to her notes section. While these are dream poems, the images and actions will likely make some readers squirm and look away, particularly with the maiming of animals, among other things. These poems are stark and sometimes profane, much like the shame and the trauma explored in the dreams. night thoughts: 70 dream poems and notes from an analysis by Sarah Arvio is poignant, frightening, and “super real.” Start with the notes at the end of the book, if you want background on her dream poems before you read them, or hold off and read them at the end to get a richer experience. This memoir/poetry collection is meant to disturb. Sarah Arvio is a poet who has lived in New York, Paris, Caracas, Rome and Mexico. For many years a translator for the United Nations in New York and Switzerland, she has recently also taught poetry at Princeton. Her poems are widely published, in such journals as The New Yorker, The New Republic, Literary Imagination, Boston Review, The Kenyon Review and Poetry Kanto and in many online reviews. She’ll be at the May Gaithersburg Book Festival for “Poetry in the Afternoon” moderated by me! 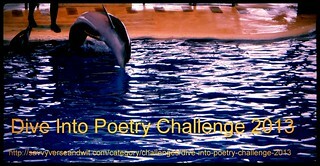 This is my 16th book for the Dive Into Poetry Challenge 2013. This is my 25th book for the 2013 New Authors Challenge.